My last pair of hiking boots were old school, full-grain leather ones that I bought during college more than 15 years ago. Whenever I wore them on long hikes I would develop nickel sized blisters on the back of my heels. In fact, I got the same blisters in the same spot during pre-college days wearing poor quality Nike hiking boots. I just assumed my feet were the problem, not the boots. Plus, I was getting used to blisters that were deep enough to leave scars. After climbing Table Top Mountain (ADK High Peak #19) last summer I decided to try asking for assistance at a local outdoor equipment store near Lake Placid. I was hoping for suggestions, but I ended up leaving with a new pair of boots and sock liners (my old sock liners from my college days were long dead). A couple days later my sister and I climbed Street (#31) & Nye (#45) and my new boots felt great! They were much lighter and more flexible. Sweet relief. Over Labor Day weekend we climbed Colden (#11) and I noticed some tenderness in my big toes. The outer edges and bottoms of both big toes were sore on the instep sides, but my heels were still OK.
Last month we headed up to climb Macomb (#21), Carson/South Dix (#37), and Grace/East Dix (#42). By the time we got back to the car my big toes looked pretty gross- lots of thick white skin, which eventually turned into a deep blister on my left toe. The blister peeled and left me with fresh, new skin just in time for our next climb earlier this month. Seymour (#34) was hard, harder than any of the other High Peaks I've climbed, and it took its toll on my toes. The blister on my left big toe was bigger and deeper than before and a toenail on my right foot has blackened suspiciously (I had clipped my toenails, so I know that was not the problem). It seems that in order to have boots fit my heel, the toe box ends up too small. At this point I almost think the heel blisters are less troublesome than toe problems. At least after the hike I can wear backless shoes until the blister heels. I can't avoid walking on my toes. 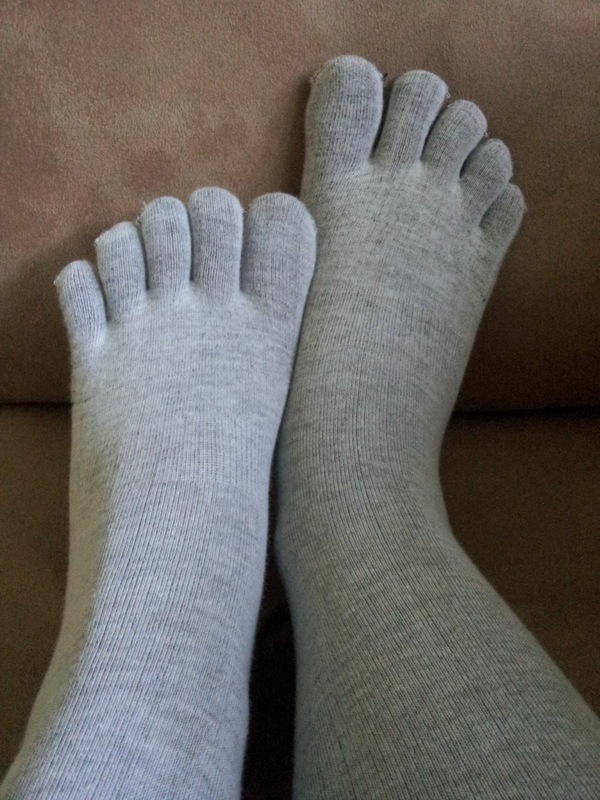 During some internet research I read a recommendation to try wearing toe sock liners under my hiking socks, so I ordered a pair. On our next hike I'll carry my regular liners in case the toe sock liners don't work out. I'm never going to give up on hiking, so I'll just have to keep trying to find a way to make it easier on my feet. Putting moleskin and tape over the trouble spots BEFORE hiking? I mean I've seen toe socks, but not for blisters etc. I used to hike/climb in bare feet, even as an adult, even on trailless mountains--no blisters, but sometimes other injuries. I must say that after trying the toe sock liners on I don't have a lot of confidence that they will help prevent blisters, but I'm willing to try just about anything. I have not tried taping. What kind of tape is recommended? I have applied moleskin, but mainly after a hot spot develops. I have trouble getting it to stay in place, which can actually make the blister situation worse instead of better. But again, this taping thing may be the key I've been missing.